With gloved hands clenched around handlebars, I was surprised I hadn’t felt cold yet. My riding partner and I were warmed by sunshine and conversation on this brisk morning. After realizing I needed to head home before her, I turned my tires north. Only then did I realize what I couldn’t heading south. 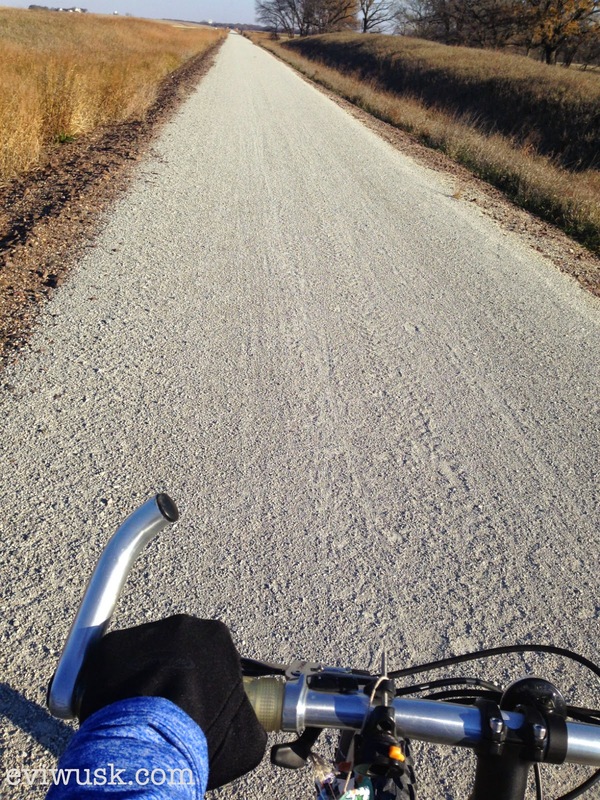 The headwind smacked me, causing my sweaty skin to prickle, and my riding smile to fizzle. Like a Monday after a great weekend, this ride back felt like work. Each turn of the pedal required oomph, as I tucked my chin hoping to cut through the bracing wind. Needless to say, this gratitude gal wasn’t feeling all that thankful. Thoughts bounced all over the place. I wished I hadn’t gone out so far–looking back without thanks, I dreaded the rest of the ride back–looking forward without thanks, and I thought over and over, IF ONLY I could be somewhere else on the trail. It wasn’t until I chose to look at only the road directly ahead of my bike and the nature on the sides of the trail that I remembered #gratitudeparty and found a way to actually enjoy the ride. It IS hard to find gratitude when life feels like a gail-force wind coming at us, when the end isn’t in sight. But how often am I focusing on what’s pushing me back? Or on what’s way ahead in the future with IF ONLY’s crowding out room for thanks. On my ride back I noticed these little clearings. I enjoyed a respite–however brief–from the wind’s rough push. These little rejuvenation stations refueled my tank, and I wonder how much harder the ride would have been if I weren’t looking. Keep your eyes just ahead. Even if you have to get off and walk, even if you have to stop completely–you’re still moving forward–time does the work when we can’t ourselves. The challenge lies in seeing the moving, whether we’re pedaling or standing still, in looking around to see the birds in the thicket just to our right, or the others around us pedaling against their own wind. Gratitude gives us eyes to see it. Choice 1: Think of someone in your life who is facing an extreme challenge–grief, depression, illness. Send them a note of thanks or give them a call. Choice 2: Make yourself a gratitude totem–a blank sticky note, a small little figurine, or a special cup or picture. It doesn’t have to be expensive or mean anything to anyone else, but place a visual reminder for gratitude in your most challenging environment. Thanks for this Kris! This comment really made my day when I read it the first time. Just had to go back and say thanks. You and Rick are awesome members of the Sterling community. So glad to be a part of it! Evi… I'm greatful that you are you…. make Ralph happy (along with your in-laws)… are a wonderful Mom and role model for all of society… and that I can call you a friend! I really think we should ask God to clone you! Hugs and Happy Thanksgiving!